Typically, real estate transactions hinge on meeting certain requirements called clauses or contingencies. The less clauses involved, the more smoothly the transaction proceeds. A sale bogged down in contingency after contingency provides too many opportunities for the deal to fall through. Even with an all-cash offer, you may find a contingency or two in your real estate contract. 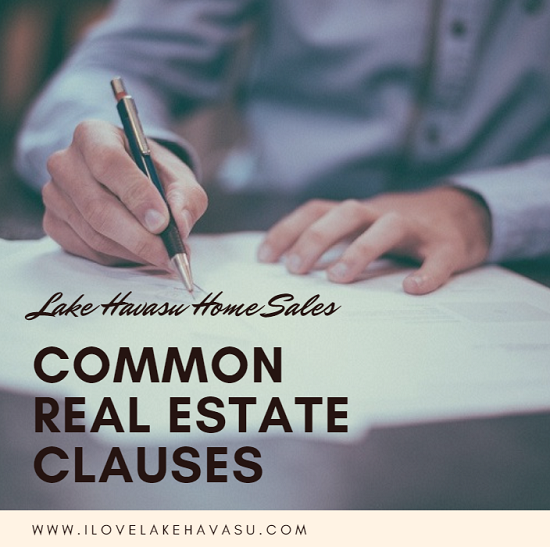 Here are a few of the most common real estate clauses in a Havasu home sale. One of the most common real estate clauses is a home inspection. Even in an all-cash situation, most buyers include a home inspection as one of the contingencies for the home sale. Seldom will you find someone buying a home sight unseen and without an inspection of some kind. Most buyers need to sell their current home before they can purchase a new one. Either they cannot afford to hold two mortgages at one time or they need the proceeds from their current home’s sale in order to receive financing for their next home. While common, this could work against the seller. Ask your agent to investigate whether or not the buyer’s current home is actually up for sale or has a sale pending. If it’s on the market, find out how long. This provides a good indication of whether or not it’s worth the risk of accepting their offer. After all, if you take your home off the market due to a pending sale and the buyer’s home sale falls through, that could end your sales contract with the buyer. Then, you end up back at square one looking for another buyer. You might want to give the buyer a time limit on selling their home before your contract becomes null and void. Another one of the common real estate clauses sellers find in their sales contract involves buyer financing. Nowadays, many real estate agents insist that buyers have financing in place before they even start looking at Lake Havasu homes. That’s especially true in a competitive market like we’re currently experiencing. With a financing contingency, the buyer can back out of the sale if they don’t get approved for the loan. Before approving a mortgage loan, most lenders require an appraisal of the home’s value. If it ends up less than the agreed upon purchase price, the buyer may have to come up with more money to make up the difference. Or they might ask for a reduction in the purchase price. It might be worth the few hundred dollars it costs to get a home appraisal before you list. That way, you can set your list price appropriately. Finally, lenders want to see a clear title before they’ll approve a loan. Clear up any liens you may have before you list. That helps clear the way for a smooth sale. When dealing with a real estate transaction, play it safe. Put everything in writing. Clearly spell out what you require in order to complete the transaction. Don’t be surprised to find the common real estate clauses discussed above in the contract. But, if the buyer insists on other contingencies, it might not be worth the hassle. Discuss your options with your Lake Havasu REALTOR® before you accept or reject an offer on your home.